How do I create a gift card in the system? Gift Cards are a great way to promote your business and get extra sales. The gift cards in WebReserv are electronic, so there is not need to print cards/paper. Customers can purchase directly from your site using the booking calendar, and purchases will be emailed to the customer who will be able to either email or print out the certificate to give to the recipient. Each gift card purchased comes with a unique code that is only good for one time use (no balance is held on gift cards). To create a new gift card, go to Setup - Gift cards. The gift card list shows all active gift cards. To Create a new gift card, select Add gift card. Enter all the details about the gift card on this page. 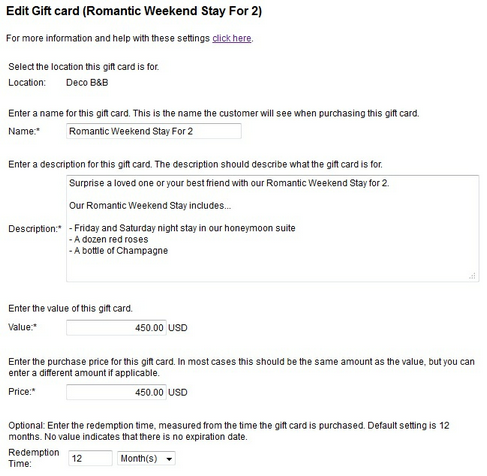 Each gift card fields and options are described below. Location & Category (only visible with multi-location accounts) - Use the location & category selector to determine what and where this gift card applies to. Name - Enter a name for this gift card. The name is shown to the customer when purchasing the gift card, so you often want to include the gift card amount in the name. Description - In the description field you can enter a description for your business. You can also enter redemption comments, terms and conditions and other practical information. Value - Enter the value of the gift card. The value is the value that the gift card certificate has when redeemed. Purchase Price - Enter the price of the gift card. In most cases, the value and the price is the same. Redemption Time - Enter the redemption time for this gift card. The redemption time is often 12 months, but can be shorter or longer. If there is no redemption time, leave the field blank. Gift card Image - Add a photo for the gift card. This picture will show on the booking calendar listing page. Email print/template - Select the email/print template for this gift card. You can use templates provided by WebReserv or create your templates (see Email and Print Templates).